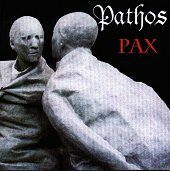 Tucson, Arizona's Pathos instantly struck me as a hard rock band that was going to scream and shout and, well, just be horribly redundant and fixed on getting their anger out. Either that or a painfully derivative modern rock band that would rather sound like Pearl Jam than themselves. However, neither of these were true, which was apparent by track two, "40 Hour Life." "40 Hour Life" is an annoyingly infectious song. The chorus sneaks up on you and gets you singing along with ease. Matter of fact, it pops up so often that you get sick and tired of it. Unfortunately, it's so catchy, you can't help but allow it to bounce around in your head each time it hits. But, from then on out, the band just gets better and better. "In My Time" is a fresh, crisp pop song that has the feel of a roots-rock feel but the pop hooks to really sink the song's melody deep inside your skin. You'll start to itch, the band is that catchy. "Unfocused" is not the band at its best. Sometimes it feels the need to sink into the land of the heavy, loud guitars. You know, play into their modern rock role. Though, the pop still pops up here and there, the guitars ruin their effectiveness. Don't worry though, the band is able to maintain themselves once again on cuts like "Senseless," "Fearless," "Peace," and "Apples," which are all pop songs you'll find yourself enjoying many times over. When they're on the mark, they're on the mark. The album does travel like a roller coaster, though. The album has its ups and downs. But, when they focus on the pop they're so good at, that is when they have you hooked. When they crawl back into the modern rock hole they like to dwell in sometimes, that is when they become throw away trash. Most often though, you can count on their pop persona showing up. I'll give the album a B-.